You tend to pursue many different activities simultaneously. When misfortune does happen, it doesn’t actually dishearten you all that much. As I may have mentioned before, I’m an atheist. Which is why I’ve just donated a tenner to help put an advert for atheism on the side of a bus. If you fancy helping out, you can donate here. If you’ve talked with me about television recently, the odds are that I’ve told you in some detail about my love of the recent archaeological action-adventure show Bonekickers. Each episode kicks off with a bit of archaeology, and ends in madness. In the first episode, our intrepid heroes find an old coin at the beginning of the episode. By the end of the episode, they are having a swordfight while swinging on ropes thirty feet above the ground of an immense cavern filled with crosses brought from the Holy Land, one of which is the One True Cross, and all of which are on fire. In the third episode, our intrepid heroes find an old coin at the beginning of the episode. By the end of the episode they are fleeing to avoid the poison gas drifting down the tunnel behind them – but the tunnel in front is blocked by an explosive minefield made from Roman hand grenades. Now, I don’t know about you, but I love a good action-adventure show. So I’m perfectly happy with the idea of archaeologists fighting evil. I mean, it worked for Indiana Jones. Where I think Bonekickers falls down is this: Each episode starts with the ordinary, and leads you into the realm of the bonkers. Compare and contrast with a James Bond film. Or indeed, an Indiana Jones film. There’s a reason that they always have that huge stunt before the credits: it establishes the sort of world that Bond lives in, and more importantly, it establishes what’s possible in that world. With Bonekickers, the world begins ordinary, and you’re led into the strangeness. Now, one of the things that I love about the show is that it does that. Each step on the route from coin to cavern is a small one, with no great leap of faith. And then when you get to the end, you have a big action/adventure. I like that change in pace. But there’s a problem with doing it like that. You start out thinking you’re watching one show. And you end up watching another. Let’s take a look at the opening credits. The first and last shots last about four seconds each, while each of the others lasts for about two seconds. That credits sequence leads you to expect a series that’s about solving the mysteries raised by archaeology. A programme like Bones, or CSI, but with archaeology. And this expectation’s then re-inforced by the fact that the show always starts in the ordinary world with them doing just that. But the thing is, that’s not what the show’s about. So you can (rightfully, I think) argue that this isn’t the show you signed up for. I think establishing that world up front, in the credits, or in the first few minutes of the show, would actually have helped Bonekickers become the success that it deserved to be. So the viewer knows what they’re getting when they watch. Because it’s not about archaeology. It’s about adventure. And right now, it’s not selling that. Blatantly linkwhored from Stevyn Colgan. Letters from America: I have a new favourite cancelled television show. Keen Eddie was a mid-season pickup for Fox last year. That means thirteen episodes. 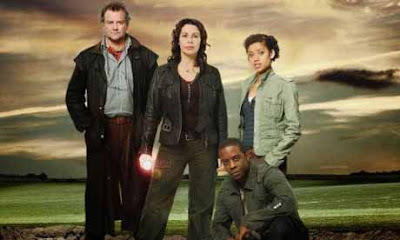 Seven were aired before it was cancelled. It’s also been shown in the UK. (Sky One in a graveyard slot, for those that are interested. Sunday afternoon. Filler material.) All 13 episodes are now being shown on Bravo in the US. I’m starting to pick up trends over here now. Tapping the zeitgeist, getting into the groove. And based on what I’ve seen, there’s no way that Keen Eddie could have succeeded. It doesn’t matter. It’s a fish out of water programme, and you don’t need to know more than that. Particularly interesting is the direction and cinematography. The show was shot in the UK, but in a US TV style. It’s a little odd to see suburban semis and council estates shot like New York tenements and LA condos, but if you can get over the shock, there’s a lot to enjoy in seeing a different visual look for London. There’s not another show based in the UK that frames its shots like this, and I think that’s a real shame. The show’s very stylised. You could think that’s good or bad. Me, I love being transported into a space where strange things happen that are completely normal to the characters. After all, isn’t that what happens in Law & Order every week? And talking of the characters, they are self-consciously coolstrange (think Buffy or West Wing) but nonetheless lovable (ditto). And if you can deal with this, the show repays a lot. If you’re not, that’s cool. As I say, it’s not easy to get into unless you’re willing to suspend your disbelief. But it does make me wonder: Alias has scenarios equally as far-fetched all of the cancelled shows I’ve mentioned, and a visual style equally strong. Why does one succeed and the others fail?